pure DC current for higher chlorine output. reversal periods to extend the life of the electrode. 5 yr full warranty on electrode. this sophisticated controller has safety dry pump protection and safety backwash feature. 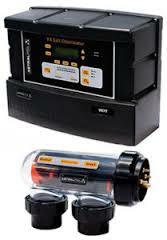 5 yr pro rata warranty on power pack and 5 yr full warranty on electrode.